"These dogs are made with beer and brown sugar, but are always a big hit with our friends and family. They should simmer on the stove for at least 60 minutes. We usually put them in a slow cooker when serving to keep them hot. Use toothpicks to spear these little bit-sized delights." In a medium saucepan, place the frankfurters, brown sugar and beer. Bring to boil. Reduce heat and simmer at least 1 hour. 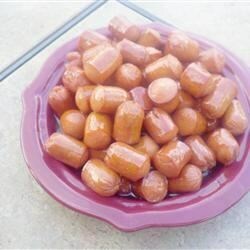 Hot dogs wrapped in homemade pretzels make the perfect party snack. very tasty, I added a little corn starch to thicken the sauce and used cocktail weiners. a big hit for parties. not bad but coctail weiners were much better. Fantastic! Served it to a large crowd. It pleased everyone's taste buds and I had to immediately share the recipe! Sauce could be a tad bit thicker, but overall it was sensational! beer and hotdogs! Could it get any better??? I think not! these drunken dogs were great. i also added corn starch to thicken the sauce. i will definitely make them again.